Answer: Without your being slightly more specific, I’m not really sure what you saw. There’s many objects that look amazing at that latitude (22.88° N). I can, however, make a good guess. More than likely, what you saw was stars … just way more than you’re accustomed to seeing back in urban LA. When you can see all the faint stars that are normally hidden by light pollution, the sky looks dramatically different. I recall my first trip out west to the Tetons. I experienced my first truly dark skies there, and was at first disoriented by the sheer number of stars that were visible. And I know my way around the sky. Look at the satellite image of Earth at night and you’ll see what I mean. 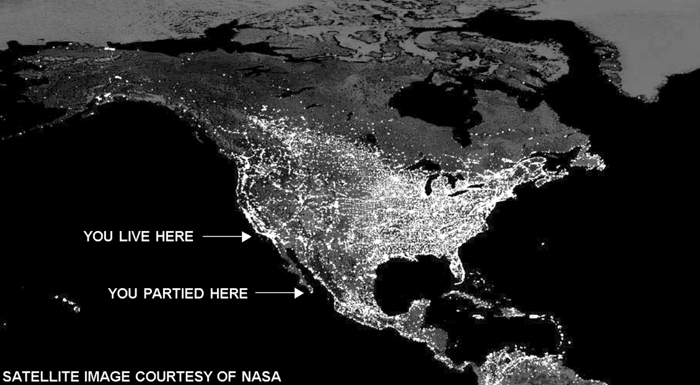 The only dark skies left in the continental U.S. are in the west. It gets better the farther north you go. Cabo, at the end of the Baja Peninsula, also enjoys darker-than-average night skies. Cabo has the additional benefit of being surrounded by open ocean on three sides. That means no light pollution will scatter in from adjoining areas. This Q&A serves to remind us that truly dark skies, like fresh water and clean air, are precious resources. So if you don’t really need that outside light, please turn it off.